Anupam and Barnali met us at the hotel at about half nine, and we took a cab to the Hooghly River (thankfully the medicines we had taken that morning saw us through the day). I think it was near Millennium park where we caught the boat. 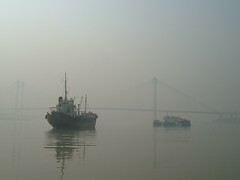 We travelled across the Hooghly, travelling away from the Howrah Bridge. The previous day I had seen this boat heaving with people, and was concerned that it'd be like that - but it was out of rush hour, and so it was not a problem and we had a pleasant trip - though the pollution was quite something. 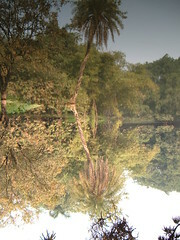 At the far bank, we walked up to the main road and caught another cab to the Botanical Gardens, it was quite some way. The Botanical Gardens are huge, we only saw a fraction of them, and like most things in India, tourists are charged a higher rate than nationals. In the gardens there are lakes, birds and (to European eyes) some strange plants. 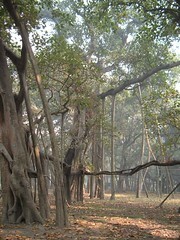 One of the highlights is the great Banyan tree. 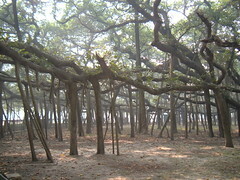 From a distance, the Banyan looks like a small forest, but it's actually one tree. It looks like many tree trunks whose branches have grown into each other, connecting the trunks. Everything you can see in these photos is one tree. The weird thing is that the entire tree has grown downwards to meet the ground from the sky - what looks like trunks are actually aerial roots. This sounds impossible, what actually happens is that the tree starts to grow as usual, and then sends out horizontal branches. As these spread, they tend to collapse under their own weight, so they send down tendrils toward the ground, the aerial roots. When these touch the ground they begin to 'flesh out' and provide both nutrients and structural support. In the case of the great Banyan Tree, the original trunk that grew upwards was diseased and removed. All that's now left are the aerial roots. The whole tree is some 430m in circumference, and still growing. We walked in the Botanical gardens some more, stopping for some lunch (I didn't want any, but Anupam insisted I ate, so I had some crisps - I could face no more). 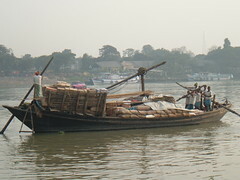 By the time we took the boat back, the air had cleared somewhat, we could see people on the banks of the river washing clothes and themselves, and also we could see the bridges clearly, and the other river traffic. The cab ride to Monica's Mum's was rather depressing. 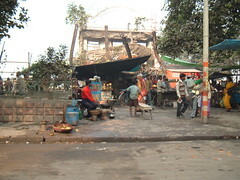 Unlike Agra, Delhi and Jaipur, Kolkata had been pretty hassle-free, but at one junction when the car stopped there was a small boy, followed by a disabled guy, then a blind guy, literally feeling his way from car to car asking for cash. All the advice tourists are given is not to hand out any money, for several reasons. This is all very well in principle, but rather different in practice when faced with such abject poverty. I found myself quietly shedding a tear. At the flat I went to sleep rather rapidly, and I wasn't in the mood for food. One of the neighbours came in with some noodles which they had prepared for us - and it would have been rude not to accept. Then Kalpana produced a fish curry, I think they called it a Chilli-fish. It tasted like chicken. It was the best fish curry to date. To my surprise the whole meal went down very well, I really didn't feel like eating beforehand, but am glad I did. Back at the Hotel (Hotel Hindustan International), we decided to go for a drink and went down to the 'Polo Bar'. This is billed as an 'English Pub with a live Phillipino band'. They had a mix of songs, ranging from 'Every Breath you take' to Bollywood. So, we were in an English Pub, with a Phillipino band, playing Hindi songs, in Kolkata, where the main language is Bengali. Unfortunately the only beer they had was Heineken. So I did the only reasonable thing for an Englishman abroad in India - I had a Gin and Tonic (extra Quinine, dontchaknow, anti-malarial). The trick I couldn't work out was how to stop him before he replenished our snacks!